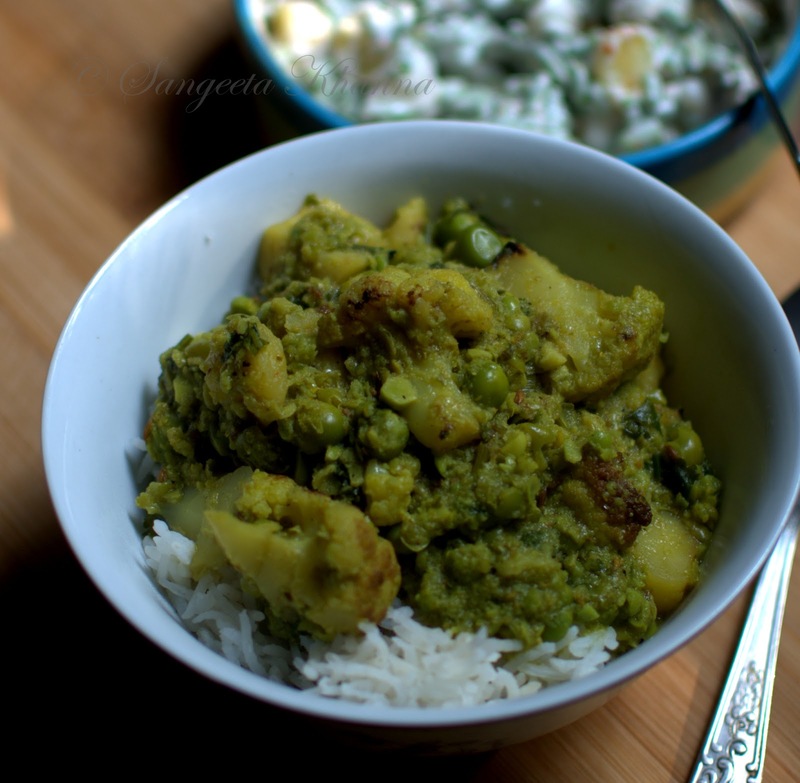 This alu-gobhi wala matar ka nimona is such a delight to cook. It always evokes memories of my grandmother who used to cook such curries with so much of love and affection thrown in for good measure. Such spicy curries were her favorites, I remember how she used to insist on grinding a fresh chutney for every meal and slicing neat wedges of tomatoes, onions and carrots or radishes for salads. Food cooked with love has so much warmth to it, we would know if we have seen our mothers and grandmothers enjoying what they did for us kids. There is no substitute of a loving touch in everyday cooking you would agree. All the measurements and accurate methods fail when the love is not poured through the ladle. And the love was poured through the ladle in the form of ghee sometimes. Fragrant and freshly homemade. Such recipes when cooked in ghee have a very distinct flavor but many people cook it in mustard oil and serve the curry with a spoonful of melted ghee for that lovely aroma. 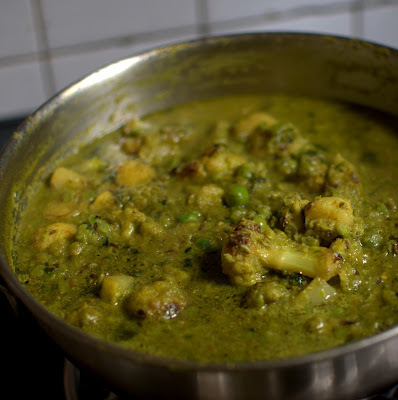 I prefer cooking this alu gobhi wala matar ka nimona in mustard oil because stir frying the vegetables in mustard oil imparts a complex flavor into this curry along with a few robust spices used. 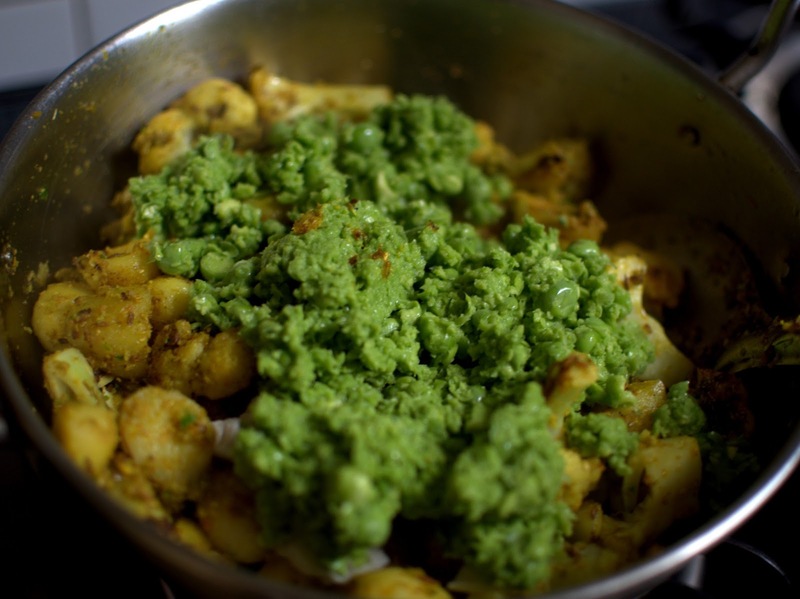 Make a coarse paste of the green peas, some of them should remain whole so if your food processor makes a paste quickly it's better to keep some whole green peas separately. Heat oil in a deep pan and tip in the cumin seeds. Tip in the small florets of cauliflowers and boiled potato halves and stir fry them on medium flame so it all gets pinkish brown in 5-6 minutes. Add salt while this step as it helps absorbing the flavors later. 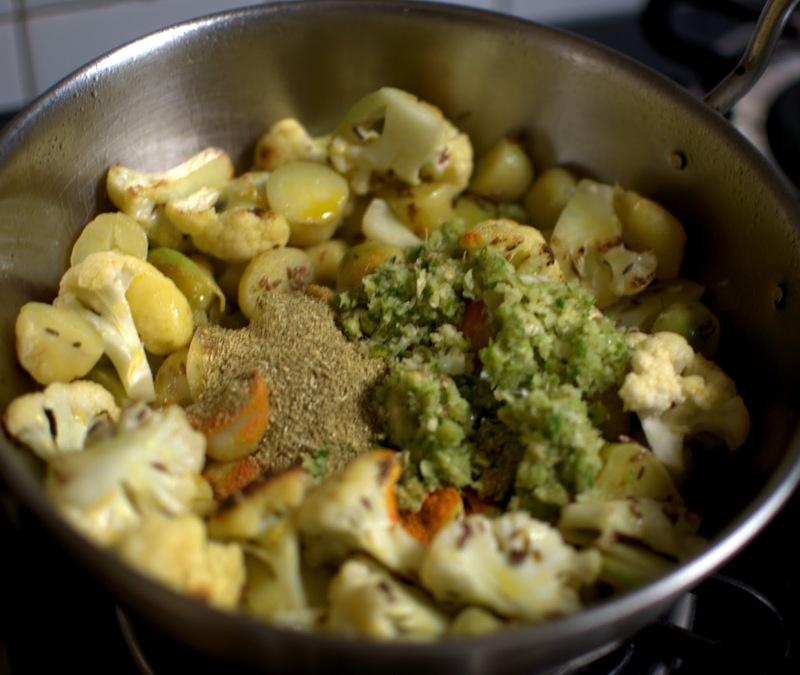 Add the powdered spices and the ginger-garlic-green chilly paste to the cooking mixture. This paste is made freshly, using about 2-3 green chilies, an inch piece of ginger and about 6-7 garlic cloves. 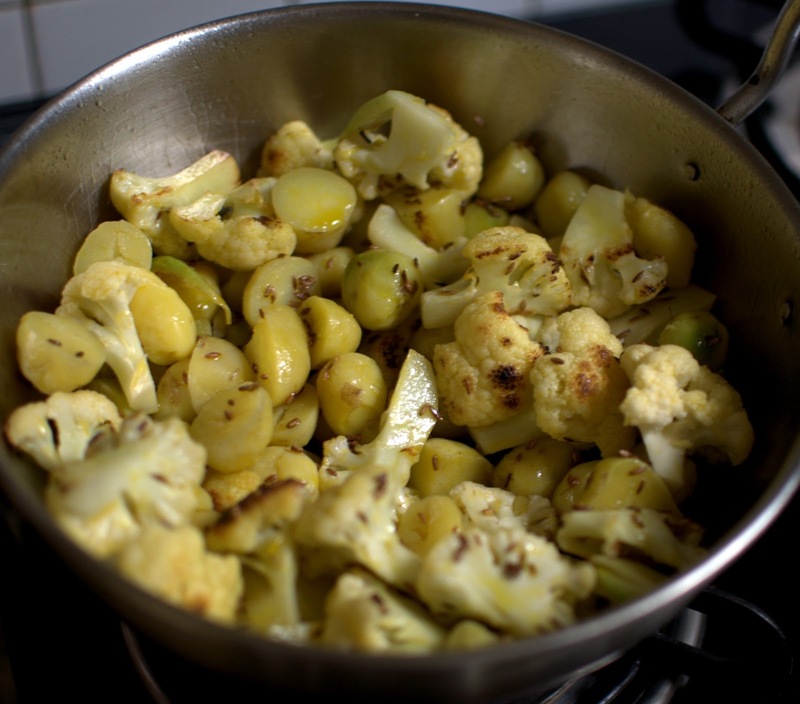 The quantities can be adjusted to taste as you might like the nimona more garlicky or more hot. Mix everything up and keep bhunoing the mixture on medium flame again. It helps the masala paste become toasted well and get aromatic. The earthy toasted aroma of the masala paste will be an indication of it's doneness. In appearance the mixture looks shiny and a little brownish. Total time taken for this step wont be more than 6-7 minutes. Now is the time to add the coarse paste of green peas. Mix it all well and bhuno again for a couple of minutes so the flavors get melded. Do not brown the green pea paste, it should just mix well with the masala paste and get a little sticky to the pan. Now is the time to add water to the cooking mixture. Two cups of water will be good enough, but go by your choice of how runny or thick you want your nimona. 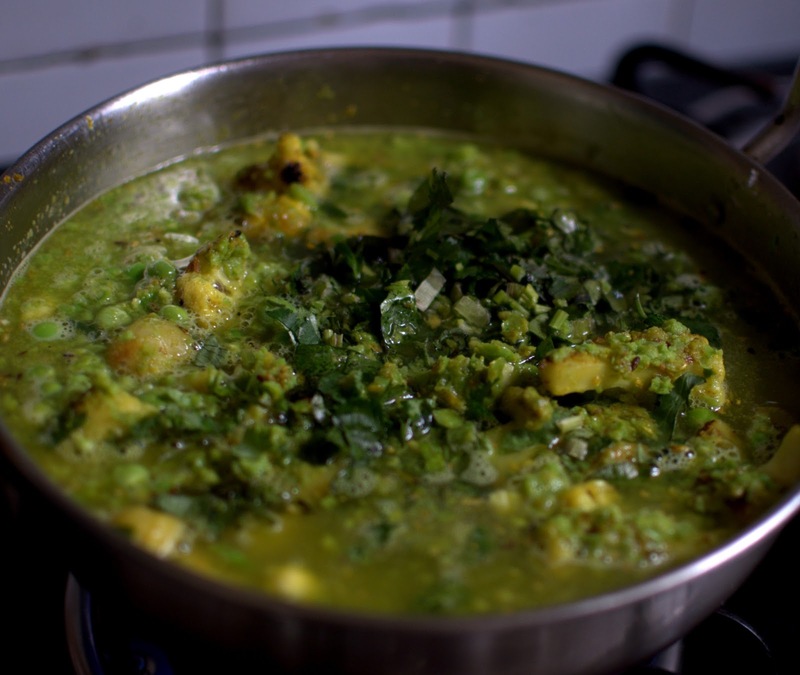 Add the chopped coriander greens and stems at this stage, cover and let the curry simmer for about 5-7 minutes. Keep the flame low just after it get a gentle boil. It helps to keep the aromas of spices within the curry mixture. On high flame the top notes evaporate. Take crae the cauliflower florets keep their shape and don't get too mushy. A firm bite in the cauliflower will be good to have otherwise it just gets lost and affects the final flavor of the nimona as it then interferes with the fresh flavors of green peas and coriander greens. Serve the nimona hot with plain boiled rice or plain chapatis/rotis. Some people like a dollop of ghee on top of the nimona, but we like it as it is. The plain nimona is essentially cooked in ghee and that has a different flavor altogether. This one with alu-gobi, uses only cumin, coriander and black pepper as spice powders that are robust flavors on spices. Garam masala (cloves, cardamom, cinnamon etc) is not used so the fresh flavors of the green peas, the new potatoes and coriander greens make the curry aromatic in a different way. We love this meal of nimona-chawal with a thick creamy raita. Any raw vegetables can be used for a raita that goes with this hot comforting bowl of winters. Someone had commented on another nimona post of mine about this alu-gobhi ka nimona that is cooked in UP homes and that made me crave for this winter treat. It was made almost the next day, took some time to come to the blog and now again it makes me crave again for a warm bowl of this alu-gobhi wala matar ka nimona. In cold weather, such meals are a bliss. See a mungodi wala matar ka nimona here..
and here are some basics of matar ka nimona that I posted in my initial days of this blog. Munh main paani aa gaya! Awesome! I'm making this for dinner tonight! Love your website. Somehow it seems like all roads lead here :). I've been following all your excellent blogs for months now. And the biggest compliment I can give you is that two different friends independently made two different awesome dishes and when I asked them for the recipe, both of them pointed me in the direction of your blog. And they don't even know each other! So wanted to thank you for being so generous with your excellent recipes. Have you got a youtube presence? I might be mistaken, but didn't you write a Chinese cookbook many years ago? My mom owns it, so I can't remember the exact title, but it is a much loved cookbook. I am so glad you and your friends like my recipes and try them at home. I find my efforts at compiling my recipes worth when I get such feedback. The same curry with a different flavour and recipe. Worth trying as it sounds and looks yummy! Such a poular dish from Eastern UP, and I had not heard about it ever before I read about it on your blog. I am sometimes so surprised at the culinary differences between the western and eastern UP. One of my friends was from UP, and he used to often mention about matar ka nimona. I am glad I found it in your food blog. I would try out this cauliflower matar nimona too. I grew up eating this type of curry but didnt know it is called nimona . 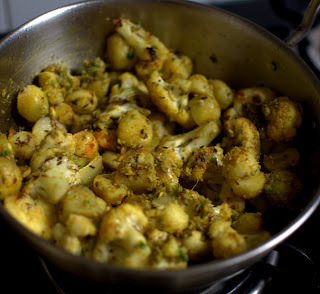 We called it aloo gobhi matar ki tari :) and after a long time I ll make it today . Sangeeta just catching up on all the favourites. This is just in time for the biting cold we have here. Thanks for sharing. Had this for lunch yesterday. Was yum!! aha..never knew it tastes good when basi :-) Will try sometime. Thank you so much. Sounds yummy. Will definitely try it out. Can I use regular potatoes instead of baby potatoes? Baby potatoes are not readily available where I live. Yes you can use regular potatoes too.